For the sixth consecutive year, the Digital Banking Report has surveyed a crowdsourced panel of global financial services leaders for their thoughts around upcoming retail banking and credit union trends and predictions. For the first time, we also surveyed the industry, including banks, credit unions and solution providers (suppliers) worldwide. fintech players that are believed to have the biggest impact in the future. By collecting insights from more than 100 global leading influencers, ranking the trends using market data, and including additional insights about the future of banking, we have created the most comprehensive analysis in the industry. For the second consecutive year, this effort was sponsored by Kony, Inc., allowing us to perform more extensive research and analysis and to publish a market-leading report. 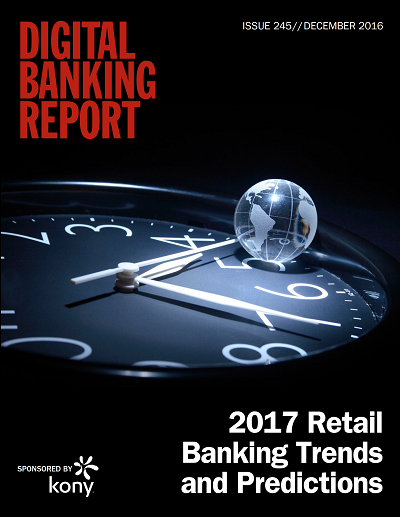 The 92-page Digital Banking Report, 2017 Retail Banking Trends and Predictions provides an unprecedented look into the future of retail banking, including the improvement of the customer journey, use of advanced analytics, building an integrated multichannel delivery network, use of open APIs, the partnership between banking and fintech, the expansion of digital payments, regulatory changes, advanced technologies and innovation in banking. Insights from 100 industry leaders as well as research results from over 800 organizations worldwide.